THIS EPISODE IS BROUGHT TO YOU BY MIMCO, THE AUSTRALIAN ACCESSORIES BRAND THAT HAS WORKED WITH THE EFI SINCE 2014. A women's beading collective working for Artisan Fashion in Nairobi, where MIMCO makes bags. 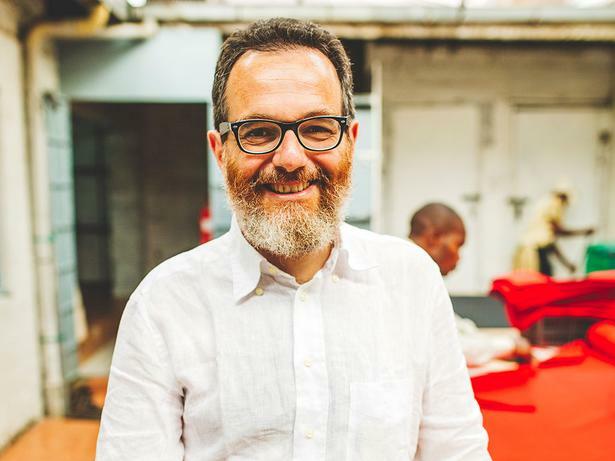 Meet Simone Cipriani, founder of the UN’s Ethical Fashion Initiative, a flagship programme of the International Trade Centre, a joint agency of the UN and World Trade Organization. The EFI connects skilled artisans in places like Kenya, Mali, Burkina Faso, Haiti and now Afghanistan, to the international value chain of fashion, working with the likes of Stella McCartney, Vivienne Westwood, Karen Walker, Adidas and the Australian accessories house MIMCO. The work empowers informal manufacturers and craftspeople to enter the international value chain - providing an income for some of the poorest people in the world. This promotes the growth of sustainable business in place of aid dependency. It provides opportunity. This is not charity, this is work. Simone sees luxury fashion as a vehicle for development. He talks about ethics and aesthetics and says: "Sweatshops and workers trapped in an endless cycle of creating cheap fast-fashion are not true fashion." He believes responsibly produced fashion can help change the world for the better. Actually, he knows it can, because he started this endeavour in 2009, and nearly a decade later it's thriving and has seen thousands of people find fair and ongoing work opportunities. This is part 1 of a 2-part series. Next week, we’ll be bringing you the podcast Clare recorded in Nairobi, Kenya with the Ethical Fashion Initiative artisans. 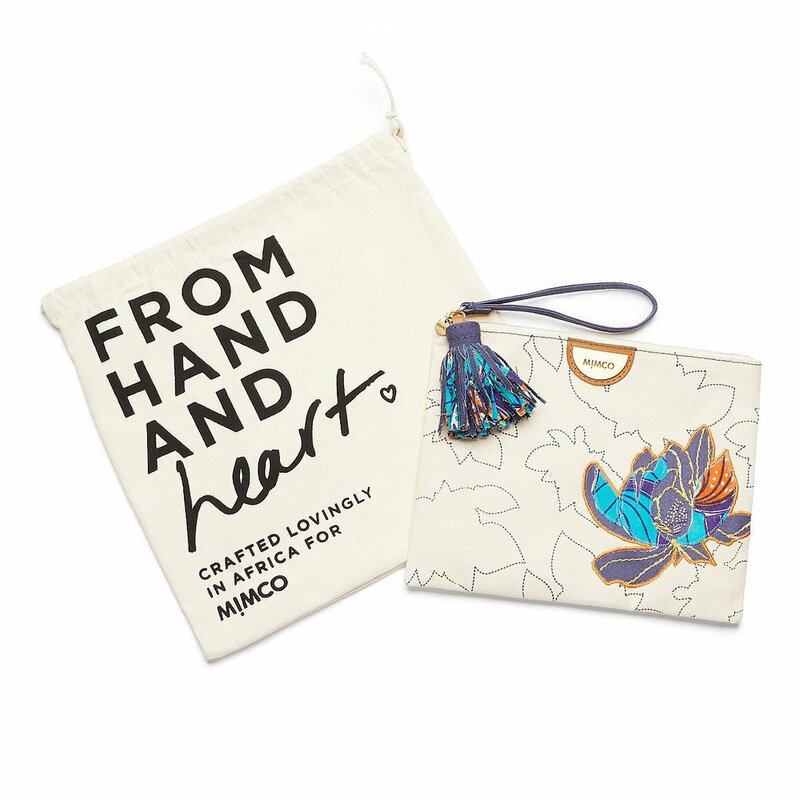 MIMCO's beautiful EFI bags. This pouch is decorated with a screen printed floral pattern and embroidered applique and beading. Each piece is lined with cotton fabric and features a Kitenge and canvas tassel. The work is audited for social impact by the United Nations. Vivienne Westwood, EFI champion. Since 2011 the British designer has partnered with the EFI to ethically manufacture Made in Africa bag lines with artisans in Kenya, using recycled canvas, re-used roadside banners, unused leather off-cuts, and recycled brass. The bags are produced at EFI/Artisan Fashion hubs in Kibera (Nairobi’s biggest slum). The collections include bag styles for men and women, including unisex rucksacks, totes, patchwork drawstring bags, Maasai hand-beaded clutches and key rings. In 2013, the Vivienne Westwood brand began working with artisans in Burkina Faso on hand-woven fabrics, and last year worked in an EFI collab to weave scarves in Nepal. BUSINESS OF FASHION In 2011, when Westwood announced her first EFI collab, she said, “It’s quite incredible to think that we might save the world through fashion.” At the same time Business of Fashion said, “Ethical fashion remains a somewhat fuzzy, idealistic concept, which has proven difficult to implement in practice.” Read the story here. As Simone says, "They were completely wrong!" ETHICAL FASHION Okay, so how do we define it? In Simone's opinion: "First of all, responsibility in the supply chain: decent, fair, good working conditions for everyone. There is no sustainability without fair working conditions." MORE DEFINITIONS. For Simone, LUXURY mean: "having something authentic, in terms of make and story. It can be a high technology thing [or] it can be made by hand but it has to be authentic." Simone disregards rarity as the principal mark of luxury today. "It used to be about uniqueness and scarcity and that will remain to a certain extent, but it's most of all authenticity," he says. "Luxury is to define your personally and to differentiate yourself from the rest." Working in Afghanistan. Simone mentions Zolaykha Sherzad. Her Zarif collection, is produced in Kabul, and employs 52 local Afghan artisans, practicing the art of "slow production." They say: "We are able to source traditional fabrics from Afghanistan and Central Asia, the former 'Silk Road', fostering fair-trade practices and the use of natural dyes. Our tailors, seamstresses, embroiderers and weavers are given a place in which they can preserve their cultural traditions that are in danger of being replaced by mass produced commercial goods. Zarif provides a platform where traditional, high-quality craftsmanship is a source of economic opportunity and personal fulfilment. At its core, Zarif acts as an ambassador, sharing the rich cultural heritage of Afghanistan and its people with the rest of the world. Sherzad told Vogue Italia she hopes to help rebuild a society and culture that's lost its identity by preserving centuries-old Afghan traditions and empowering the people within: “Our cultural identity was at risk, and Afghans were losing their pride in their homeland. I wanted to do something to revive that pride,” she told the magazine. Read her interview here. Centennials and sustainability, values and the power of storytelling. 66% of global millennials are willing to spend more on brands that are sustainable, according to the State of Fashion 2018 report by BoF & McKinsey. Millennials are also more aware of the textile industry’s environmental and social shortcomings than older generation, say Business of Fashion. The world is changing and there is a generational shift, say us. Mali & natural dyes. Mali possesses a strong textile heritage, including bogolan fabric and indigo dyeing. For inspiration, check out the stunning work of French raised, Mali born textile artist Aboubakar Fofana, who os known for his work in reinvigorating and redefining West African indigo dyeing techniques. Based between London and Cape Town, SINDISO KHUMALO launched her eponymous label after being a finalist in the Elle New Talent competition. Known for her strong, graphic prints she has a background in textile design & works with several NGO’s in South Africa to develop sustainable textiles. Aisha Obuobi was inspired by her seamstress grandmother to found Ghanian label CHRISTIE BROWN. She says: "our aim is to infuse modernism into carefully curated traditional African aesthetics that transcend international tastes. It’s about the female expression of her experience of the cultural opulence of Africa without self-compromise." Ghana-based STUDIO 189 was co-founded by Rosario Dawson and Abrima Erwiah. It's an artisan-produced fashion lifestyle brand and social enterprise, made in Africa that produces African and African-inspired content and clothing. And it's fab.